The first time you try to go in it is not easy. You tend to wonder how people can like something like this. But as you do it more often, you start enjoying it and realize that it is indeed the best there is. Moreover I’m talking about a phenomenon that most of us are familiar with. In fact nowadays people are forced into this at a very young age, as they have no other option. It is hard to get in the first time, you hate the crowd and a few of us tend to feel claustrophobic. But, it’s indeed the lifeline of Amchi Mumbai. Youngsters today use it on a regular basis to get to school as it saves time as compared to the school buses of the past. Lastly the more you use it, the more you appreciate the time it saves and like it! I’ve been here in Mumbai for about 3months now. Before I could land in Mumbai, I had a lot of people advising me to rent a residence very close to my place of work. Another bunch of them trying to tell me how horrifyingly crowded a train would be. But, as always I stood with my belief that ‘Experience is thy best teacher’ and decided to try it out on my own. 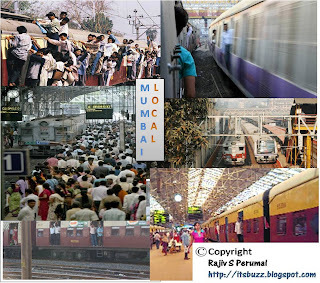 So let me share a few of my experiences in Mumbai Locals. I have structured my article drawing inspiration from Shakespeare into Acts! J Act 1 to Act 4. I landed in Mumbai on the 22nd November 2009 and reached my aunt’s place in a silent location in Mumbai called Malabar hill. The next day was my first day at work, a new page in my life. I was to go to Malad from the Grant road station (these are two stations on the Western Line in Mumbai which are 35kms apart). I bought a ticket (and initially wondered how it could be so cheap, just 8 bucks!) and waited for a train. The train came by and I got in, it was all ok (for an instance I thought what were all my friends fussing about.. hmmm.. sissies). The train went on and it reached the ever famous Dadar station, and all of a sudden people got into the train as though the world was about to end, and this was the only train that would take them to safety. People stood everywhere, on the windows, above the train, between compartments and a huge number of them hanging out and still giving an expression of being in a luxury suite of a five-star hotel! That is the exact moment I got to know from a co-passenger (who guessed from the look on my face that this was my first time) that there was also a first-class compartment to this train. A little too late, but nevertheless the train went on, and there was an announcement that ‘Goregaon’ was approaching (this is the station that precedes Malad). Just then my co-passenger told me to stand in case I wanted to get down at Malad. Finally we were at Malad, and before the train could come to a complete halt, this person from behind shouted ‘MALAD’… and the next thing I knew, I was on the Malad Platform (and thankfully in one piece, but for the rest for the day, I was forced to call my shirt a crushed look designer wear).. I was proud to have got my first class pass made for the route, and I stood with pride and a crease-free shirt with a ‘cool water’s’ fragrance. The train came by and I got in, it seemed a nice journey today. No pushing and even the crowd getting in at Dadar was comparatively saner, I felt delighted. The train went on, it reached Andheri(one of the major stations on the western line between Grant Road and Malad) and interestingly a lot of people got in and the train halted there for a surprising 3mins. And, all of a sudden the train started moving backwards. Before I could react, there was my second lesson in Mumbai, not all trains goto Malad, there are trains that go only till Andheri and Bandra. 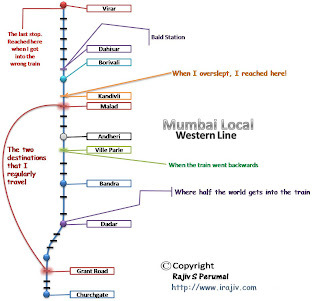 A few days went by and I soon got the hang of Mumbai trains and especially the western line. I started talking the railway language, ‘Churchgate Fast, Borivali Slow, All fast trains after 8 stop in the last three stations’. I was pleased with my new skill in using public transport so effectively, something I had never done in Bangalore. Moreover it was a small feeling of an achievement of sorts. Over a period of time, I started getting off at Ville Parle and going with a friend of mine in his car (as he was bored to drive alone to Malad). I used to give him a buzz when I reached Santa Cruz station and it was like a signal for him to get ready. Then one fine day, I got in to the train as usual, it went on and suddenly I get a call from this friend of mine asking me if ‘I’m not coming today’. I wondered why he was asking this, and Just then the announcement in the train said ‘next station Kandivili’ (this station comes after Malad). I’d slept for the first time in a Mumbai train and it turned out to be another mistake rather another experience for me in Amchi Mumbai’s very own local train. An experience that is rather common. Act 4: Why only me? I had made the mistakes and learnt the hard way. I had gone through crowded trains, I’d overslept and I had got down in a wrong station. The final Act which I would call a grand finale was on a Thursday evening when I had to attend a friend’s wedding reception at Borivali. I finished work at Malad, had to goto Andheri the same afternoon for work, after which I took an auto to Borivali (as the trains in this route during evenings were too crowded). It took me just 2 hrs and 20mins to reach Borivali, but nevertheless I’d reached on time! I met my other friends and had a nice time. It was about 11.30 when we guys decided to leave. All my friends stayed rather closer to Borivali and hence decided on taking an auto. But for me ‘train’ was the only option. As this place was at the end of Borivali west, I could’nt get an auto to the station. Finally one guy agreed to drop me for 100bucks to the station, not Borivali but Dahisar. I agreed (not like I had any other options) and reached the station. It was a rather bald station, with literally nothing. No proper digital sign boards no people no chai-walas nothing. I waited for 15mins and a train arrived. I got in only to discover 5mins later that this was a Virar fast (Virar is the last station on the western line, it was about 55km from my destination Grant Road) and I had got into the train in the wrong direction. Holy Jesus Christ I exclaimed, but what could I possibly do. I thought it to be very risky to get off at any other station and hence I had to goto Virar and come back to grant road in that very train. Anyways I did manage to get home safely by 2.15 that night. out to grab that one more commuter and whisk him on board. Here the metal of the compartment is unfurled like some grotesque petals, side and top. i cant help but wonder abt shakespeare effect .this is the 3rd post I am reading with his name this week..
@MJ: lolz.. well, ive kinda got ma act together!! :P what where m headed nowadays!! n yeah thnx fr the wishes!! @Nav: Thanks Nav... It surely does get u ready for anything in life!! People are so busy that sometimes u tend to 'wanna over-work' urself!! Very interesting! And you have a flair for writing. Keep it going. Interesting and well written Rajiv!